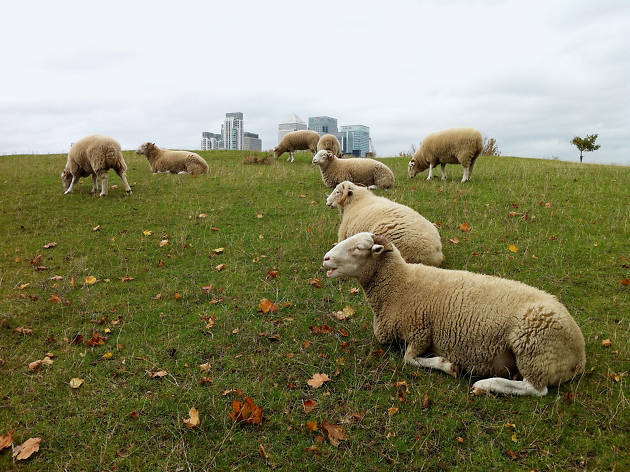 These 32 acres on the Isle of Dogs make up one of London’s biggest farms. Mudchute Farm's main attraction is the Equestrian Centre, a riding school with an all-weather arena and show jumps. Good news is the ever-popular café recently reopened and is still serving brilliant breakfasts. The farm itself is surprisingly compact with some animals just wandering about in the fields, plus a petting zoo and duck pond. Some of the best residents include a Manx Loaghtan named Juliet (it’s a type of sheep, duh) and a turkey who enjoys hearing ‘Old MacDonald Had a Farm’. The alpacas, Clause and Columbus, have better manners than their long-faced llama cousins, who have a tendency to spit. Charming. One of London's hidden gems, with skyscrapers in the near distance. I took 2 children here in the summer holidays and they loved it! Being able to buy food to feed the animals was great and there was a variety of animals to see. The cafe has a wide selection of food and drink, including ice cream for those hot sunny days. One for the animals lovers. Mudchute Farm is a family friendly farm located in South-London. It’s easily accessible via the DLR on Mudchute station, the farm is big but not overwhelmingly so which is good news for people like me who can’t bear leaving a place without exploring every nooks and cranny. 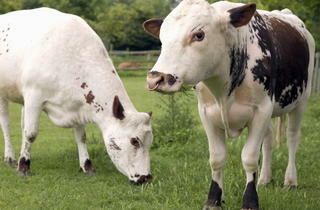 Many of the animals that you will encounter are farm livestock. So, we’re talking about llamas, pigs, ducks, canaries, rabbits (awwwww! ), ponies, horses - you get the picture. Many don't bite and you’re free to pet and interact with them including buying animal food to feed them. No, you won’t come face-to-face with a tiger or a lion like you wouldn't London Zoo. But this place is totally FREE and has loads of space for a family picnic and for the little tots to run around. There’s also an onsite cafe to refuel should you need and plenty of space for a stroll. On a nice, sunny day, it’s a delightful way to spend your weekend. Being so close to Canary Wharf, it’s unbelievable to imagine a farm like this can exist so close to all gleaming skyscrapers and shiny offices. I highly recommend a visit. It’s a gem in London that needs to be discovered. I did some work experience here when I was young and I cannot sing the praises of this place highly enough. Not only do they provide amazing service to the community, it is great little gem not far the city. It does not feel like you are in central London. Highly recommended. Within a stone's throw of London's financial district, Mudchute is the last place you'd expect to find a charming farm ideal for a relaxing afternoon away from the hustle and bustle, without having to leave London's confines! This past weekend I found myself walking around Canary Wharf, neck craned back as I ogled the surrounding skyscrapers and a lot of the area taped off for the highly anticipated London Marathon happening the next day. Given the nice weather, it was incredibly busy and before long I wanted out. As I walked towards home in Greenwich, I stumbled across Mudchute Farm, somewhat by accident, and how glad I was that I did! The free farm is an idyllic escape from the chaos that is London. It is almost unbelievable, with the backdrop of Canary Wharf's looming buildings, that a farm even exists in such a developed urban area but this is what makes it all the more charming! The farm has a strong collection of animals including pigs, sheep, llamas, alpacas, turkeys, chickens and so on. Perfect for families, you are free to roam the farm, visiting the animals, watching them be fed and for the hour or so you'd probably spend there, completely forgetting about the stress of city living. Whilst I did not partake this time round, I also have it under good authority that the cafe serves up great food and that the horse riding lessons are perfect for those of all ages and all levels. 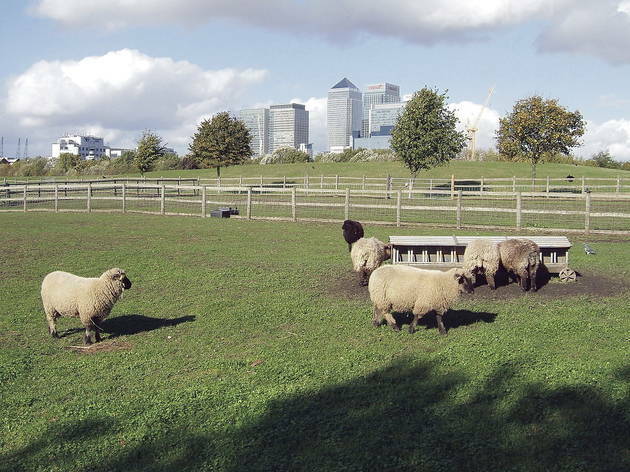 If you find yourself free on a sunny afternoon, get down to Mudchute Farm for an 'urban breather'! Ideally located between the charms of Greenwich and Canary Wharf, this place is a godsend for families. Not only is there a variety of animals here, but the breakfast comes highly recommend. The gift shop is well stocked and the staff are extremely approachable and willing to share their knowledge. The best time to come is definitely during spring where you can see cute young lambs and piglets. However, the young ducklings (in the picture) grow VERY quickly so don't delay in visiting them as soon as they hatch. Great place for kids and families. Close to the overground station and supermarket parking space. 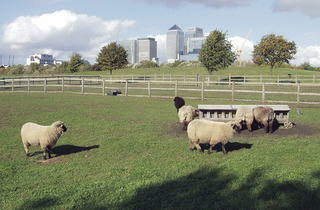 Beautiful views with Canary Wharf buildings in the background contrasted with country side like space and animals. Good fun! A stones throw away from Canary Wharf, this is a great family day out. It's free, which is always a bonus and it's very kid friendly, you can feed the animals and also book horse riding classes. There's a cafe on site and the breakfast and cakes are delicious! 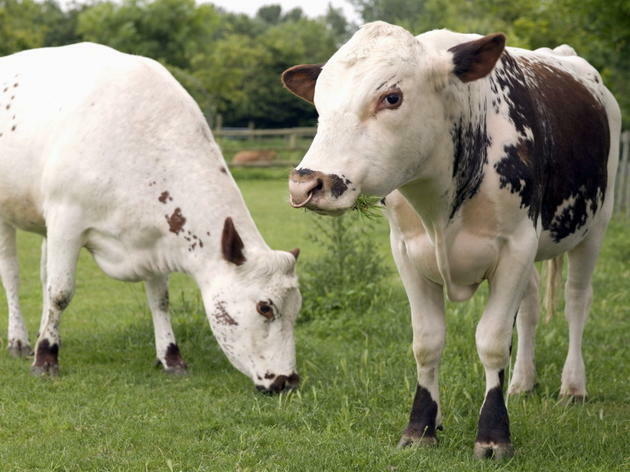 Being a country bumpkin at heart, sometimes in the midst of the black smoke and skyscrapers of London, I yearn for some fresh air and a touch of nature- if this sounds like you, head to Mudchute Farm and get your farmyard fix! 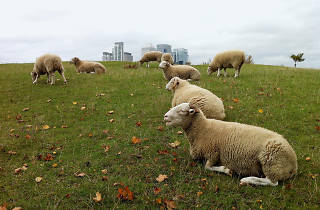 With the backdrop of the iconic Canary Wharf, Mudchute really epitomises the urban farm. With horses, llamas, alpaccas, donkeys, pigs, sheep and a menagerie of exotic birds and smaller animals, there is plenty to see. The best way to experience the animals is to buy some feed for a very reasonable 50p and go and make some furry friends. If you aren't an animal lover, the beautiful surroundings are ideal for a long walk, one which isn't confined to roads and pavements. And to refuel after your trek? Head to the cafe for a scrummy cake, all at purse friendly prices. With its free entry and easy accessibility from the City, Mudchute is the perfect day out for the family or for a childless early twenty-something with a love for goats.